"Issues with the client’s original kitchen consisted of an inefficient walk in pantry, inadequate downdraft ventilation, outdated appliances, worn wood floors, inflexible builder cabinetry, and an awkward expandable baby gate used to contain pets as needed. To provide efficient ventilation and maintain a visually open space the cooktop moves from the island to an adjacent wall contained in a new hearth. The reconfigured island provides increased work surface. Belgian blue stone in a classic French pattern replaces heavily worn wood floors. Eliminating headers above the cabinets provides visual continuity and additional cabinet space. A walk-up pantry provides easily accessible storage. Dedicated spaces in the island and surrounding cabinets allow convenient recycling, office and dog food/equipment storage. White cabinetry and Calacatta marble work surfaces contrast with a rich quarter sawn oak island and refrigerator surround. 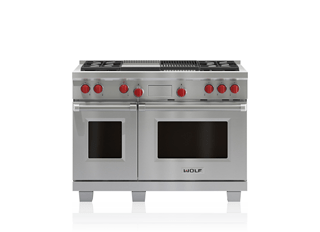 Stainless steel Sub-Zero, Wolf, and Cove appliances introduce a modern contrast and provide professional grade, durable cooking and refrigerated storage. A cleverly concealed oak gate isolates the kitchen space as needed. Eliminating a double height counter opens the kitchen to the rest of house and a gilt bronze lantern adds decorative continuity to the kitchen. 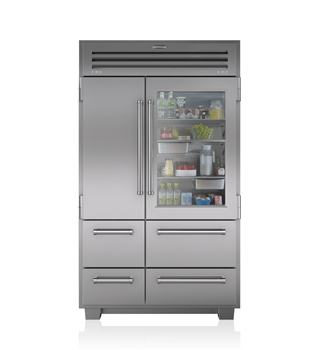 A nearby bar niche houses a Sub-Zero icemaker as a complement."